So... I started counting calories again two weeks ago. It's been three years since I lost 35 lbs. and since then I've gained 25 lbs. of those back. Stupid weight! I'm not doing any fancy diets this time... just watching what I eat, and not snacking (well, on crap anyways). The bonus though this time is my friend Sarah is also on the weight loss train as well... it's much easier to do this with a friend (even if it means late night texts of "I would kill someone for chocolate right now"). Tonight I ventured a bit out of my comfort zone and kind of made up a recipe - well, I had about three recipes open on Pinterest, but I made my own variation. And hot damn, it tasted awesome! Here it is for anyone that would like to try it. 2. Steam broccoli florets - I boiled about 1/2 inch of water in the frying pan I was going to use and once boiling, put in the broccoli and covered for about 5 minutes. Once that's done, drain water and put broccoli off to the side. 3. Stir fry the beef in a bit of canola oil - don't overdo it though... you don't want tough beef. 4. Add sauce to the beef - it will start to thicken because of the cornstarch. 5. Add in broccoli. And voila! 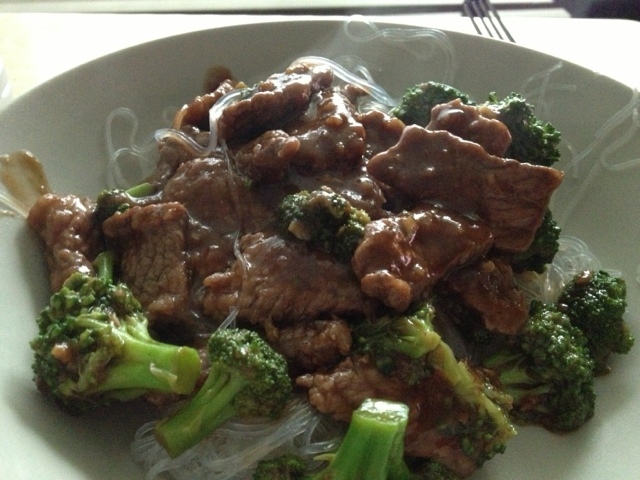 I served mine over rice vermicelli noodles. I find if something is "harder" for me to eat, I eat slower and enjoy more. That's why I went with the noodles and not traditional rice, but it's totally up to you. For me, the dinner, including noodles was between 550 and 600 calories, and filled me up. I'll definitely be making this again! woo hoo! good job lady! Getting back on track isn't easy or popular, but it makes you feel better in the end! I love pinterest for amazing recipes! !